I learn about dnstop when reading rolland's presentation slide, thanks to his comment in my blog. The presentation title is Listening to the Network: Utilizing Telemetry to Detect and Classify Network Traffic, I enjoy reading it as I have learned some new tricks or two from his presentation. One of the tool he has mentioned in the presentation is dnstop and I figure it is available in either Ubuntu packages repository or FreeBSD ports, I decide to try it out. I read about this and this. Enumerating Goodness has its own weakness though, the mimic attacks that look legit will create false negative and be categorized as Goodness. Security through obscurity is not a great idea and to certain people it sounds dumb as if the application/software that you are trying to protect is vulnerable, you will be eventually exploited, however it does asist for defensive side because it helps to prevent against automated tools and also requires offensive side to perform more steps to achieve what they are trying to do and this leaves more footprints to be examined and traced by the defensive side. It can be considered as early warning of its kind if you know how to make use of it. This is just my personal thought and feel free to discuss about the topic. There's no perfect model or principle. I'm digging into network flow analysis for a while. 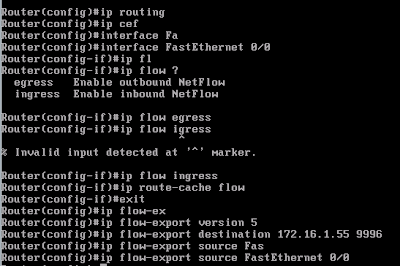 The single screenshot below is to show how to export Cisco Netflow version 5 to the flow monitor at 172.16.1.55, simple and straightforward. The router model is Cisco 7200 series. Malaysia Tourism, visit the malwares!!!!! If you are security.org.my reader, you may find the latest post about Malaysia Tourism Website is serving malwares to everyone. This is not big surprise as Malaysia Internetwork is largely contributing to malwares distribution globally according to Google. So this "Malaysia Can" spirit continues, we are distributing malwares to people around the world efficiently. I'm wondering how much our lovely government has spent to setup and maintain the web sites, let us know if you have clue. All the information contained herein is correct at the time of publication. Whilst every effort has been made to ensure the accuracy of the contents, Tourism Malaysia shall not be held liable for any errors, omissions or inaccuracies which may occur. That's great, don't blame them as they have thrown the best effort! I downloaded the executable file and tried to scan it using ClamAV with no result, therefore I uploaded it to Virustotal to scan through different Antivirus Softwares. The result is decent, out of 31 types of Antivirus Software, only 12 recognize it as malware. If any of users who are using those Antivirus Softwares that still don't detect it, congratulations! The result of scanning is here. I would like to thank to my friend - tehtb who is the decent Windows Programmer, I was silly to tell him maybe we can use print function and he pointed me out msgbox function works well here. This is the trick from one of the spam I received today which redirects me to download malwares and it still works now, hopefully Google fixes it as soon as possible. 1. Dubai hotel is expensive! 2. The hotel foods are always the same! 3. Pizza express is nice! 4. We always have great support from Army! 5. Dubai Gold Souk has too much golds! 6. Rufio and Niresh are upset because of .....! 7. I met all the cool people there! 8. The conference party is real fun because we get to hang up with beers! Bruce talks about the distance between the feeling and reality of security. I'm not really a guy who emphasizes on conceptual or semantic, however I think people will never get it right between the believe and reality, the line is blur because you can never educate the masses about the technologies that keep evolving from time to time. I don't know Christopher personally, I attended his talk because the topic has something to do with intrusion detecion, seriously there's nothing really new or advance if you are following cutting edge intrusion detection technologies for long time. Most of the time Christopher is just explaining what IBM ISS offers and they are better than other vendors in comparison. Their system also emphasizes on session data by importing NetFlow data and we can't consider it as new stuff(think NSM). We are seeing more and more vendors taking session data seriously now. Alessio talked about his experience of making fun with voip system during CCC in Italy, I like his term of spitting, you should check out his presentation slide once it is up online. I would say fear the embassy who can reach you anytime, that's really entertaining talk from Mayhem. He also demonstrated the device which can change the voice at the end of the talk. I'm not into lock domain or I know nothing about it at all, however I'm really impressed with Marc's work to crack the lock, and respect his 40 years passion in the same domain. I'm just 5 years old in network security industry and hope I can keep my passionate to network security field like he does. Cesar is the CEO of ArgenISS who sponsored our conference party, he showed us the weakness of design flaw in latest windows technology by kidnapping the token of particular process threads and you can gain the access priviledge to do anything you want. This is not something that can be fixed easily and therefore he has informed Microsoft before the presentation. If you want to know more about it, feel free to check out his presentation slides. This is the talk from Motorola guys, they discuss their experience of penetration testing for 3G Networks, their conclusion is pretty simple, most of the security issues derive from the deployment phase where the party that setting up the network has to meet the timeline and leave most of the devices with default setting. As long as they are connected to the IP networks, you can basically probe them easily. I'm not database expert and don't know anything about Oracle at all(I use MySQL or PostgreSQL), I like Alexander's formalized approach to perform forensics process on Oracle Database System, he classifies different kind of malicious attackers with different kind of purposes and attentions, by knowing what kind of malicious attackers you are dealing with, you know what kind of sql statement will be queried by them, and that's really good lead to figure things out. Alex is really a bright guy and he shares his stuffs, he has written the scripts to retrieve all the necessary information to find culprits and evidences from the database system. I'm wondering if similar approach can be applied to MySQL and PostgreSQL and maybe should start looking up on this. Pdp and Adrian are both thinktankers from Gnucitizen, I'm one of their blog readers(as always you can't forget about offensive security techniques while you are in defensive side), they are concluding their works of client side hackings and embedded devices cracking. If you are their blog reader, you should be familiar with all the stuffs they are sharing during the presentation, I like their single slide explanation where they only show the meat of particular hacking trick so that you can understand them easily. I think they are trying to deliver the mindset of "hacking through simplicity" and it will just work most of the time. Mel(Spoonfork) and I presented Defensive Network Security, this is the first time we deliver our talk in Dubai, I hope whoever have attended our talk enjoy it and thanks to the 22 years old Amy for not sparing even 5 minutes. I miss some of the presentations as both presentation tracks were running at the same time, anyway I will grab their presentation slide once they are online. Overall I enjoy the HITB conference in Dubai this time(congrates to Rufio as the new CTF overlord this time, hopefully you will suffer for another few years). This conference party was organized on the cruise, and I bet everyone was enjoying the alcohols after "long fasting". See you guys in next HITB Conference again!!!!! Me and Chfl4gs_ decided to start the development of HeX System since mid of April 2007, and it's much improved with the involvement of other active members. Today it turns one year old. Happy birthday to HeX, and thanks to the raWPacket team members to make it happen. SAN JOSE, Calif., and LONGMONT, Color., April 1st, 2008 – Cisco and the SguilTM project today announced an agreement for Cisco to acquire the SguilTM project, a leading Open Source network security solution. With hundreds of installations world-wide, SguilTM is the de facto reference implementation for the Network Security Monitoring (NSM) model. SguilTM-based NSM will enable Cisco’s customer base to more efficiently collect and analyze security-related information as it traverses their enterprise networks. This acquisition will help Cisco to cement its reputation as a leader in the Open Source movement while at the same time furthering its long-held vision of integrating security into the network infrastructure. Under terms of the transaction, Cisco has acquired the SguilTM project and related trademarks, as well as the copyrights held by the five principal members of the SguilTM team, including project founder Robert "Bamm" Visscher. Cisco will assume control of the open source SguilTM project including the Sguil.net domain, web site and web site content and the SguilTM Sourceforge project page. In addition, the SguilTM team will remain dedicated to the project as Cisco employees, continuing their management of the project on a day-to-day basis. To date, SguilTM has been developed primarily in the Tcl scripting language, support for which is already present inside many of Cisco’s routers and switches. The new product, to be known as “Cisco Embedded Monitoring Solution (CEMS)”, will be made available first in Cisco’s carrier-grade products in 3Q08, with support being phased into the rest of the Cisco product line by 4Q09. Linksys-branded device will follow thereafter, though the exact deployment schedule has yet to be announced. SguilTM is the leading Network Security Monitoring (NSM) framework. It is built for network security analysts by network security analysts. Sguil’s main component is an intuitive GUI that provides access to a wide variety of security related information, including real-time IDS alerts, network session database and full packet captures. SguilTM was written by Robert “Bamm” Visscher, who was apparently too cheap to buy a book on Java or C.
With this deal, Sguil will go into active and sharp development very soon and kudos to the Sguil team, I would say Cisco has made the best decision ever!!!! !